It seems like most online shopping sites expect you to want to dress like an 18-34 year old regardless of what your drivers' license says. But there are many who think this is bunk -- a 40+ saying if ever I heard one! According to Christina Binkford, fashion writer of the Wall Street Journal, online sellers better get with the boomer program. Are online marketers so youth-conscious -- because it feels right -- that they're ignoring lucrative markets just when they're most needed? The Internet is neither new nor young. The fastest-growing segment of Facebook users is women over 55, according to the Tracking Facebook blog. And the underlying assumption that young people are still the Web's most fertile market doesn't hold up to scrutiny. In fact, 65% of online apparel sales go to women over age 35, according to market researcher NPD Group. Among these, the fastest-growing sales are to women between 55 and 64 years old -- a boomer population that has always been known for its willingness to indulge. "It's so stupid," says David Wolfe, creative director of Doneger Group, fashion industry consultants. "The people doing the programming are still deluding themselves that the 18-to-34-year-old market is going to save them." In fact, it's grandmothers who may save them. Online sales to women aged 25-34 fell 8% in the year ended in March, but sales to 55-to-64-year-olds rose 11% -- recession be damned. Read the whole article here: Forgotten Market: Older Women - WSJ.com. The demand from the boutique, fashion and accessories market is growing for finer jewelry. The team that brought you Couture (I'm consulting for them) is working to put you in front of a new and exciting market – the thousands of fashion and accessory buyers and boutique owners who shop the Chicago and LA Fashion Weeks. 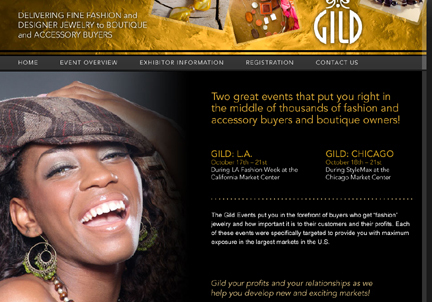 The new trade shows are called GILD and they're 3-day turnkey booths in the Mart buildings of those two cities. Boutique buyers are learning how important jewelry is to their customers and their profits. These two shows are perfectly timed to be a part of the LA Fashion Week (in Los Angeles) and StyleMax (in Chicago). I'm excited about this new venture -- it opens up new markets for the tradition designer jeweler -- and I'm looking forward to bridging the gap between boutiques and fine jewelry. Visit the Gild website, or contact me for more information.